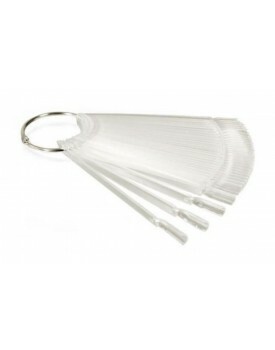 This colour ring is ideal for showing your clients the full range of shades you offer.Supplied with .. The Edge UV Gel kit, the perfect training kit and choice for students or as a starter kit. A one-ph.. Kit Contains: 1 x gel wipe off 100ml1 x primer pen1 x uv gel white 5g1 x uv gel pink ..
Mad Beauty Practice FingerSlotted for easy application of nail Sticky peel off foam bottom.. The Edge Acrylic Powder & Liquid Trial PackContents:-1 x Small Acrylic Powder CLEAR 8g 1 x..